I always love to find new potential replacements for my best loved beauty products and experimenting with new looks using them. One of my 'can't go out the house without' makeup products has got to be my Kate Moss lipstick -- I use Rosetto (shade 05) from the Kate Collection. My lips literally feel naked without a coat of this! Some of you may have recently seen my posts testing out lip transfers, leaving me with the possibility of swapping my trusty Rosetto for something slightly different... The last transfers (Vicious Lips) that I used were from the Lynx Nails and Beauty range. This time, I have a new little brand to open your eyes to. 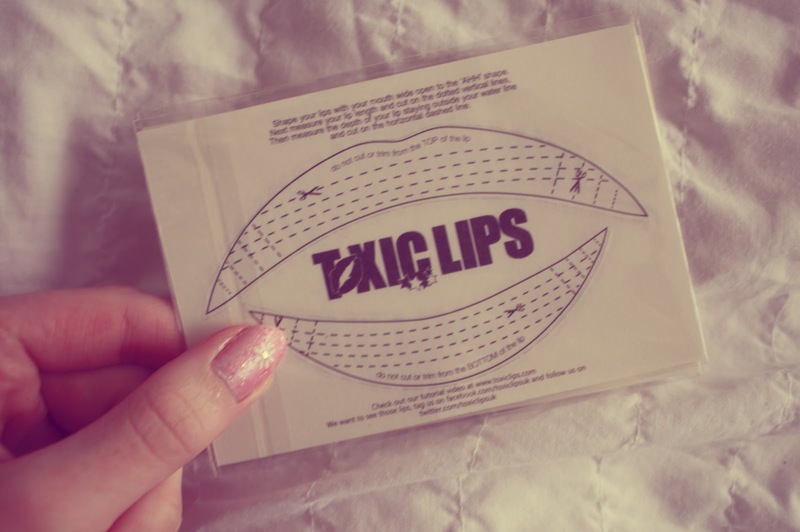 I have recently been in contact with a company called 'Toxic Lips'. 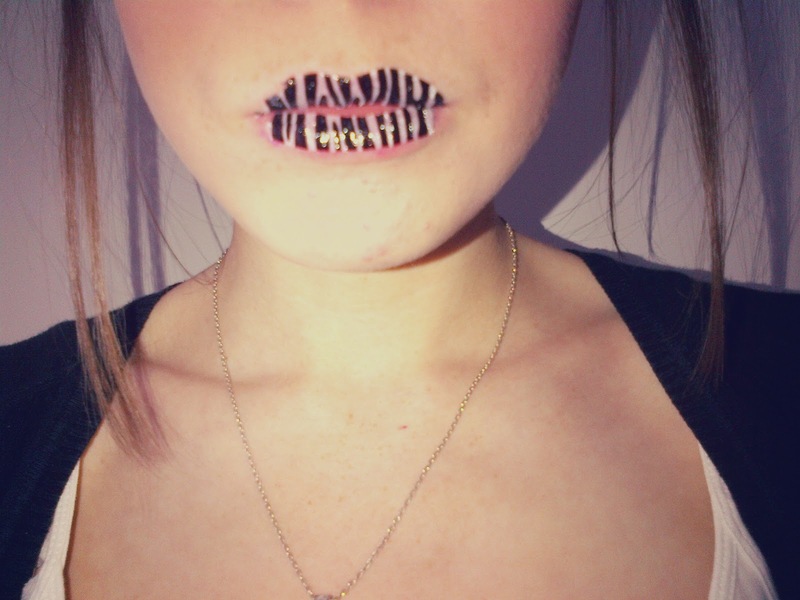 For those of you that have not yet heard of this brand name, they specialise in lip transfers, with all of their designs costing £5.95, which is good competition for Lynx Nails and Beauty (whose designs cost £6.95 for a pack of three transfers). I was sent two of my favourite designs from their website (although I also had my eye on their glitter patterns!). The designs I received were 'Pink Polka Dot'* and 'Zebra'*, both of which I couldn't wait to try out -- each packet came with two sheets of each pattern. I'm going to start by saying that I was SO happy to see these transfers were pre-cut, and just needed to be pressed and popped out from the card. The last few attempts with LN&B didn't work quite so well for me because I was required to cut the shape from scratch to fit the shape of my lips. The transfers I received this time had guidelines on the back, showing possible cutting lines depending on how long/short or wide/thin you required each piece. When it came to sizing, I cut the design on the closest line to the centre to get the best length for my lips, and with regards to depth, I used the second dashed line as my guide in the correct direction (i.e. for the top lip, it states 'do not cut or trim from the TOP of the lip' and vice versa for the lower one). By this point, I realised that despite being given the guidelines, the upper lip was not going to fit mine so well.. I found that the upper lip wasn't curved enough, so it went straight across the middle rather than following the curves of my mouth (even making an 'ahh' face). I didn't have this issue so much with the bottom lip though. Upon application, I found these transfers FAR easier to come away from their packaging than the LN&B ones; the slightest dab of water and I could already see the design forming on my lip. As I was given the guides, the application was far less messy than last time -- I knew that once I removed the card, I wouldn't have to peel away any excess pattern that had gone over my lip line. As far as the design goes, I must admit, as much as I loved the outcome of the pair, I wouldn't have the confidence to go out wearing the Zebra print. 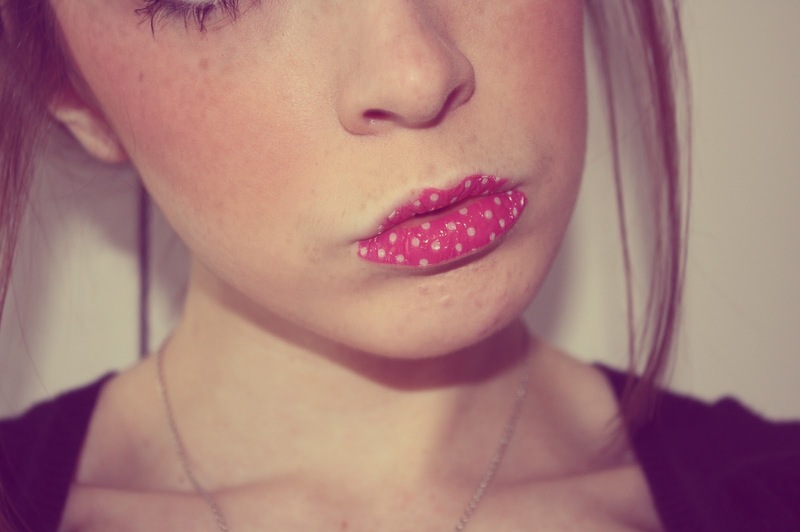 The Pink Polka Dot pattern was far more neutral and closer to my natural lip colour -- I nearly had to answer the door wearing it and I wasn't even phased! The two of these patterns have also given me the idea to possibly experiment with one of my lipsticks as a basecoat, some eyeliner (sounds bizarre, I know...) to draw animal print, and a topcoat to keep it in place once I run out of transfers. I wore these for a short amount of time in order to properly show you all how they both came out, so I cannot vouch for how long they would last without being touched (their website says that it should be between four and eight hours, long enough for a night out!). They came off reasonably easily, well, a large amount peeled off on the upper and lower lip when I tried to remove the transfers, but I struggled getting rid of the little bits around the edges of my mouth, which resulted in my lips feeling a bit chapped -- I tried to remove these bits with water and just scratching at them with my nails.. it's kind of like when you would use arm 'tattoos' as a kid, and after a few days you're left with just traces of the picture? The website does say you should use baby oil and a wipe to remove them easily but sadly I didn't have any baby oil in my house -- hopefully you guys do if you decide to try these out! 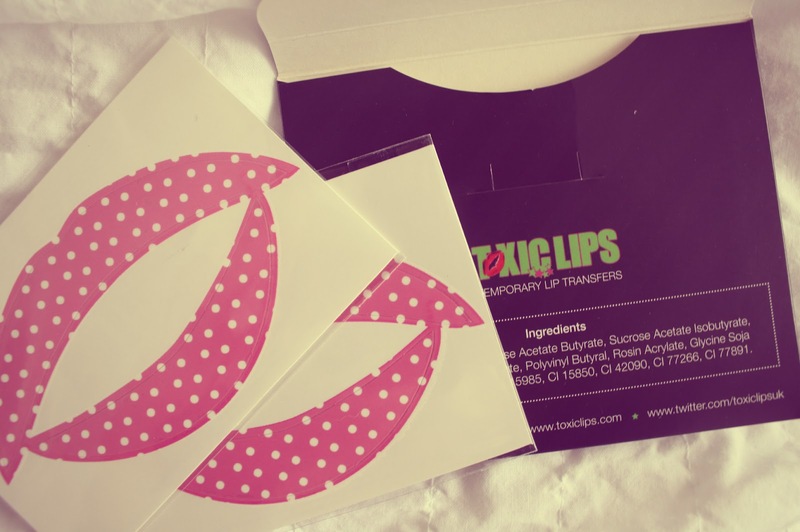 All in all, Toxic Lips are really good value for money. Their website offers a good range of designs including Leopard print, glitters and rainbows. I found the company very customer-friendly and easy to get in contact with via Twitter. 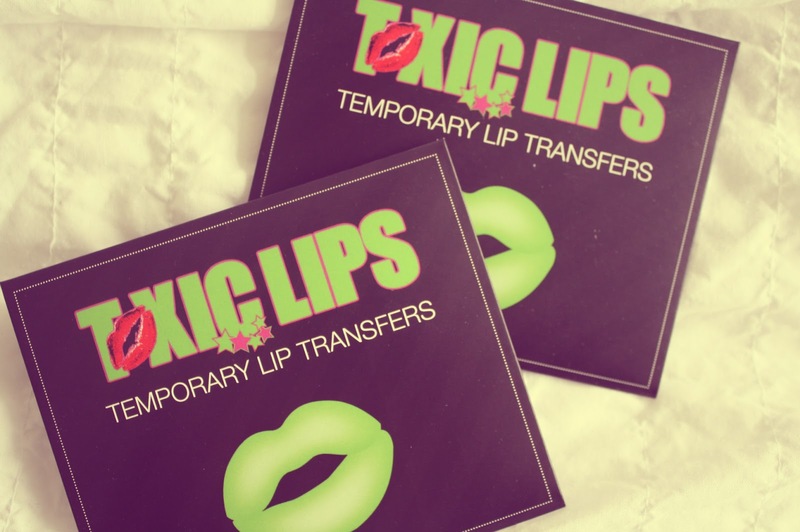 Their delivery was exceedingly fast too, so Toxic Lips are in my good books. I love the polka dot ones!